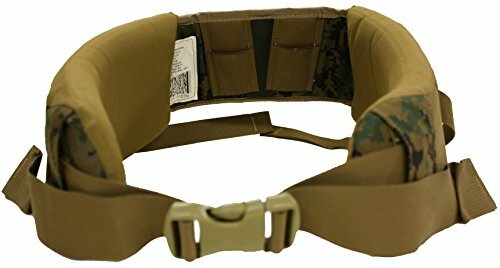 Marine Corps MARPAT Hip Belt for ILBE Main Pack Woodland MARPAT Improved Load Bearing Equipment (ILBE) Hip Belt. ILBE Packs (Improved Load Bearing Equipment) to replace the heavier MOLLE Packs (Modular Light Load Carrying Equipment) and was specially designed for the US Marines to provide durable lightweight means of transporting clothing textiles and equipment. These are Generation II and the Gen II pack has the coyote brown padding and features. Produced in the Digital Woodland MarPat (Marine Pattern). Dimensions: 30" x 6" x 11/2"